The Sitka count circle was established for the 1975 count year (Winter of 1974-1975). With the exception of the 1980 and 1981 count years, there has been a count every year since that time. This will be my third year participating. The satellite image with count circle overlay gives some idea of the kind of terrain we try to cover during the count. I think it is pretty safe to say that a significant part of the circle has never been covered during any count. I am uncertain about historical efforts, but in the last couple of years, there has been pretty good coverage of the road system, and at least a couple of boats that made an effort to count in the protected waters. This means that locations not easily accessible by road or protected waters are not typically counted. This includes many square miles of forested lands, from the interior of islands in the sound to the valleys and mountains of Baranof Island not immediately adjacent to a road or easy trail. 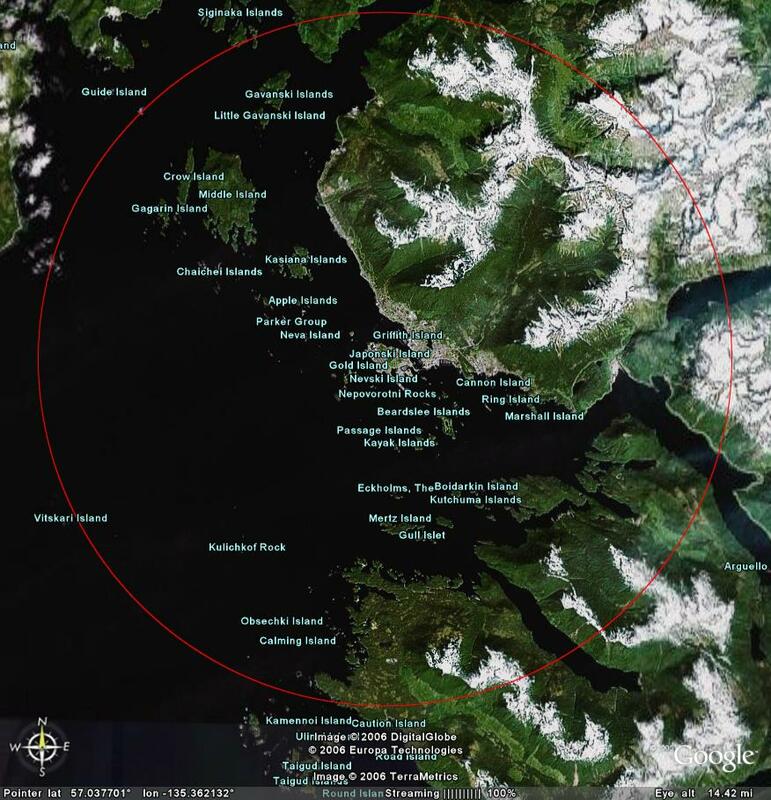 The more exposed waters of Sitka Sound included in the circle are probably also not usually counted. The last couple of years (2004, 2005), I have made some effort to cover areas that have not typically been counted. I have climbed Mt. Verstovia and come down a mile or two up Indian River Valley. This time of year, the days are short, so I typically start as it’s just starting to get light and manage to make it home around dark. Even with this effort, I am only able to count a small thread of territory at the edge of over 30 square miles of the count circle containing wilderness mountain peaks, valley bottoms and everything in between. I think it is interesting to look at the numbers over the years. There have been 150 different distinct species reported over the 30 years the count has been conducted. The average number of species found per year is 61.5, with a maximum of 80 species in 1979 and a minimum of 44 in 1976. An average of 20 people per year have participated with a high of 54 for the 2005 count and a low of 8 on the first count. People often count in small groups, so a better measure of the amount of effort to count may be the number of party hours. This gives the combined number of hours spent by each party. It’s pretty clear that some years must have tended toward smaller groups and individuals than others. The most party hours reported was for the 1991 count when 20 individuals logged 85 party hours. The next highest was 65 party hours for the 2005 count when 54 people participated (in fairness, the weather was pretty lousy for that count also). There are 21 species that have been reported all 30 years. They are Rock Pigeon, White-winged Scoter, Surf Scoter, Pelagic Cormorant, Pacific Loon, Northwestern Crow, Mew Gull, Mallard, Long-tailed Duck, Herring Gull, Harlequin duck, Glaucous-winged Gull, European Starling, Double-crested Cormorant, Dark-eyed Junco, Common Raven, Common Murre, Common Merganser, Common Loon, Bufflehead, and Barrow’s Goldeneye. In addtion, there are 12 more species that have been reported in 29 out of the 30 years. Among those species that were reported in 29 of 30 years are Bald Eagle, Chestnut-backed Chickadee, Belted Kingfisher, American Dipper, Black Turnstone, Winter Wren, and Varied Thrush. Although they are not all abundant, these are typically easy to find in easily accessible areas. In some cases, it seems likely that the person who saw them was not comfortable identifying the species. For example, the only year with no Black Turnstones recorded was 1994. However, there were 50 sandpiper sp. reported that year, almost double the next highest count in that category. In 1983, no Bald Eagles were reported. I wonder if that was an oversight during data submission or something as most years there are well over 100 eagles counted. Birds that are difficult to observe due to location or habit, but not as uncommon as the count might indicate. These birds would include some owls, ptarmigan, and various alcids that tend to stay in deeper water. Birds that are not unusual during some other times of year, but seen out of season during the bird count. Species in this cateogry include Lincoln’s and Savannah Sparrows, Brant, Greater White-fronted Goose, Pacific Slope Flycatcher, and some of the shorebirds. This years Christmas Bird Count for the Sitka Count Circle is scheduled for Saturday, 16 December. The pre-count meeting will take place on Thursday, 7pm at the Alaska Raptor Center. Audobon CBC Count Tables: Records for all years and all count circles are available from this website. The formatting of the tables tends to make them quite large if you include many years, so they can take awhile to download. Sitka Count Records is a page I made with all the Sitka count records somewhat simplified in a much smaller download. Google Earth was used to create the satellite images. 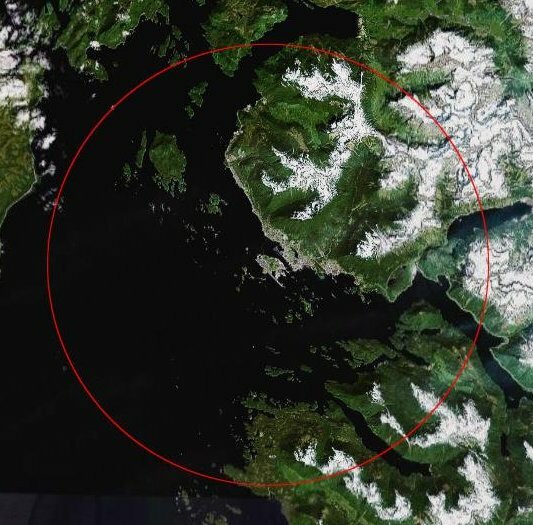 How to create a count circle with Google Earth. This entry was posted in birds, photo and tagged Christmas Bird Count. Bookmark the permalink.